Namo gurubhyah, namo buddhaya, namo dharmaya, namo sanghaya. 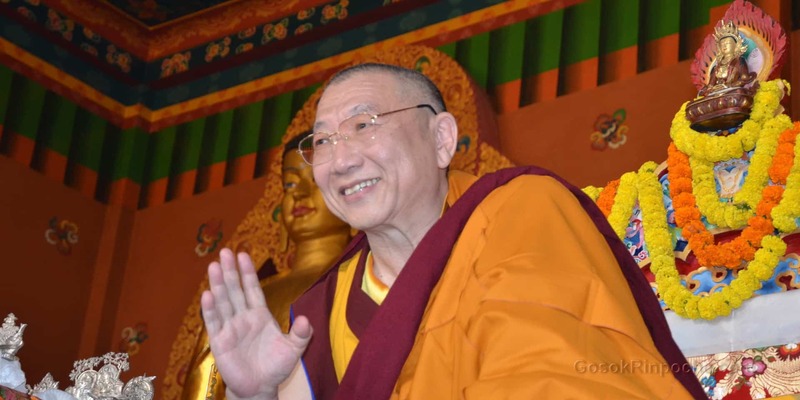 May all limited beings have happiness and the causes for happiness. May all limited beings be parted from suffering and the causes for suffering. May all limited beings never be parted from the happiness that is without any suffering. May all beings abide in equanimity, parted from dualistic (feelings) of close and distant, attachment and repulsion. Om I prostrate to the noble, transcendent liberator. Homage to Tara swift and fearless, With eyes like a ﬂash of lightning, Lotus-born in an ocean of tears Of Chenresig, three worlds’ protector. Homage to you whose face is like One hundred autumn moons gathered And blazes with the dazzling light Of a thousand constellations. Homage to you, born from a gold-blue lotus, Hands adorned with lotus ﬂowers, Essence of giving, effort, and ethics, Patience, concentration, and wisdom. Homage to you who crowns all Buddhas, Whose action subdues without limit; Attained to every perfection, On you the bodhisattvas rely. Homage to you whose tuttaraand hum Fill the realms of desire, form, and space. You crush seven worlds beneath your feet And have power to call all forces. Homage to you adored by Indra, Agni, Brahma, Vayu, and Ishvara, Praised in song by hosts of spirits, Zombies, scent-eaters, and yakshas. Homage to you whose treyand pey Destroy external wheels of magic. Right leg drawn in and left extended, You blaze within a raging ﬁre. Homage to you whose ture destroys The great fears, the mighty demons. With a wrathful frown on your lotus face, You slay all foes without exception. Homage to you beautifully adorned By the Three Jewels’ gesture at your heart. Your wheel shines in all directions With a whirling mass of light. Homage to you, radiant and joyful, Whose crown emits a garland of light. You, by the laughter of tuttara, Conquer demons and lords of the world. Homage to you with power to invoke The assembly of local protectors. With your ﬁerce frown and vibrating hum, You bring freedom from all poverty. Homage to you with crescent moon crown, All your adornments dazzling bright. From your hair-knot Amitabha Shines eternal with great beams of light. Homage to you who dwells in a blazing wreath Like the ﬁre at the end of this age. Your right leg outstretched and left drawn in, Joy surrounds you who defeats hosts of foes. Homage to you whose foot stamps the earth And whose palm strikes the ground by your side. With a wrathful glance and the letter hum You subdue all in the seven stages. Homage to the blissful, virtuous, peaceful one, Object of practice, nirvana’s peace. Perfectly endowed with sohaand om, Overcoming all the great evils. Homage to you with joyous retinue, You subdue fully all enemies’ forms. The ten-letter mantra adorns your heart, And your knowledge-humgives liberation. Homage toturewith stamping feet, Whose essence is the seed-letter hum. You cause Meru, Mandara, and Vindhya, And all three worlds to tremble and shake. Homage to you who holds in your hand A moon like a celestial lake. Saying taratwice and the letter pey, You dispel all poisons without exception. Homage to you on whom the kings of gods, The gods themselves, and all spirits rely. Your armor radiates joy to all; You soothe conﬂicts and nightmares as well. Homage to you whose eyes, the sun and moon, Radiate with pure brilliant light; Uttering haratwice and tuttara Dispels extremely fearful plagues. Homage to you, adorned with three natures, Perfectly endowed with peaceful strength. You destroy demons, zombies, and yakshas; O ture, most exalted and sublime! 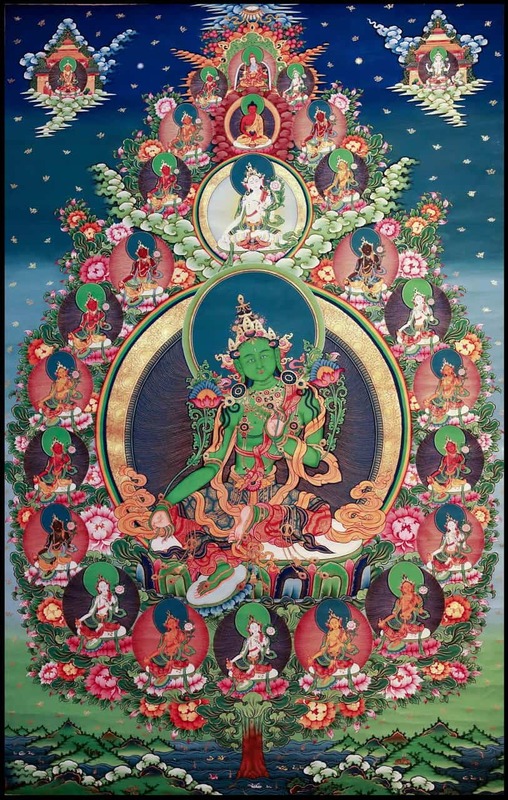 Thus, the root mantra is praised, And twenty-one homages offered.